The Otago Peninsula is full of a range of awe-inspiring wildlife, scenery, the picturesque Otago Harbour and of course there’s the friendly local residents. Known as the Wildlife Capital of New Zealand, the area features some of the world’s rarest and most stunning species of marine life including Royal Albatross, Little Blue Penguins, Yellow-eyed Penguins and New Zealand Fur Seals – and it’s only a 45 minute drive from Dunedin city. 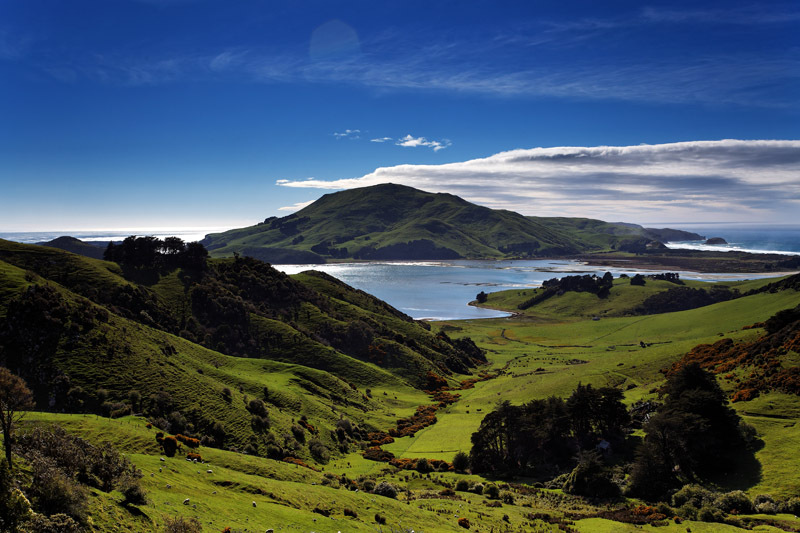 The Otago Peninsula is predominantly of volcanic origin, steep and on the Pacific Ocean side very rugged. The harbour side is warm, sunny and sheltered and has a micro climate that is better than anywhere else on the Otago coast. A number of hiking tracks and walkways along the Otago Peninsula give you access to many breathtaking views and sheer cliff faces like “The Chasm” and “Lovers Leap”. The top of Harbour Cone, climbing to 315 metres or just over 1000 feet above sea level, can be reached by foot from several places. The Otago Peninsula is home to many secluded beaches and lagoons, these are teeming with wildlife and offer spectacular scenery. 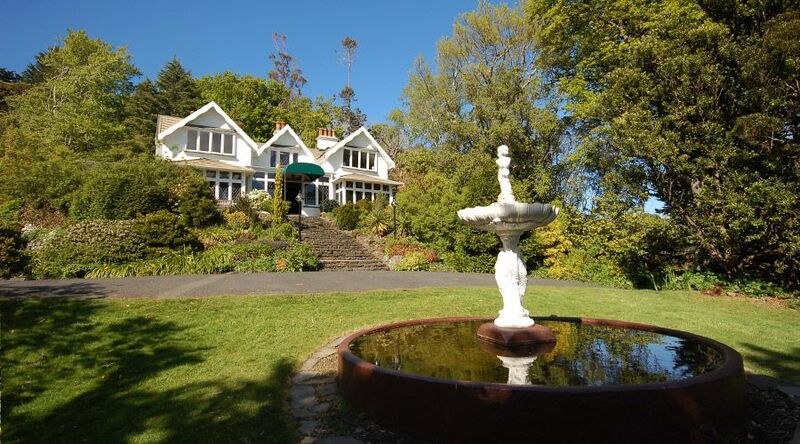 Add to this Larnach Castle the only castle in Australasia, Glenfalloch Gardens, Fletcher House, historic lime kins, the Marine Studies Centre Aquarium, Fort Taiaroa, local Arts & Crafts and your peninsula experience is complete. Even when old man nor’easter whips Otago Harbour into a frenzy of white caps, there’s serenity to be discovered in a glade above the water near Macandrew Bay on the Otago Peninsula. Glenfalloch. Hidden glen. Sheltering a microclimate that belies the elemental nature of this beautiful peninsula, just a ten minute drive from the centre of Dunedin city. Home to a picturesque Jetty that pokes out in to the Otago Harbour, an impressive native garden featuring a 1000 year old Matai tree, the historic Glenfalloch Homestead (now the headquarters of the Otago Peninsula Trust) and of course the Chalet that plays host to a range of special occasions and events including weddings, family celebrations and business events.Stroll among the rhododendrons, azaleas, magnolias, fuchsias and a profusion of other flower species which integrate with native ferns, exotic imports and indigenous New Zealand trees. 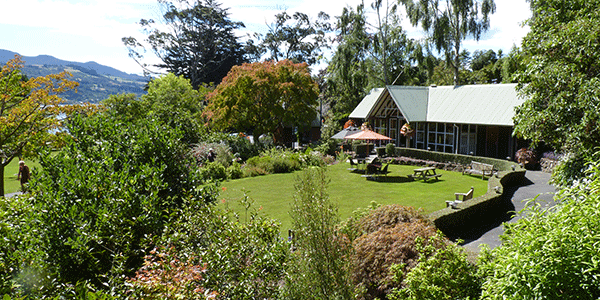 You can visit Glenfalloch for a donation (free for Otago Peninsula Trust members). Listed with the New Zealand Historic Places Trust, the Taiaroa Head Lighthouse is one of the most iconic landmarks on the Otago Peninsula. 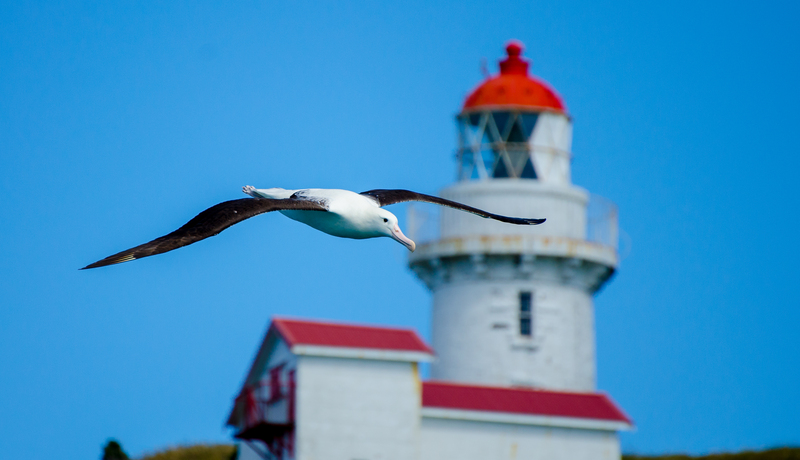 The lighthouse is located directly in the middle of the Taiaroa Head nature reserve and unfortunately is not accessible to the general public. However, you can get a great view of it from the Taiaroa Head viewing platform or by taking a Unique Albatross tour. 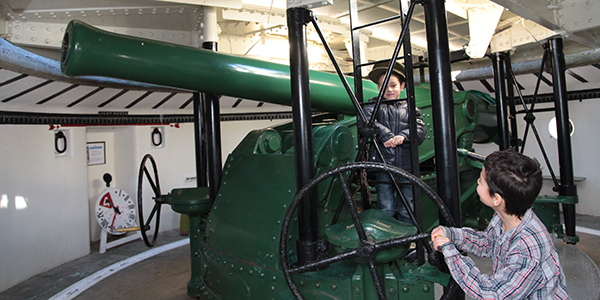 Built in 1885 after a show of strength from the Russian Military, Fort Taiaroa features a series of historic underground tunnels, a museum honouring past residents and soldiers and is home to the world’s only fully restored Armstrong Disappearing Gun in its original emplacement. Sited in an underground circular gun pit and mounted on a hydro-pneumatic carriage the gun can be aimed, raised and fired in a matter of seconds before being returned to its underground position to be reloaded. 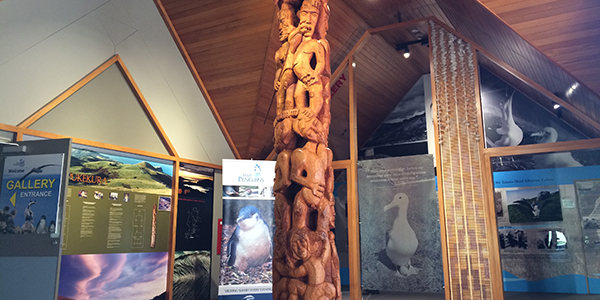 The Poutokomanawa located in the heart of the Royal Albatross Centre tells the history of the people of the Pukekura (Taiaroa Head) headland. Originally settled as a fortified Pa by local Maori, it was considered a vastly important fortress and stronghold for the local tribes and features prominently in the Te Wai Pounamu (South Island’s) tribal history. Famous Whakapapa represented on the Poutokomanawa include Karetai (who signed the Treaty of Waitangi in 1840) and many other significant historical local figures. The lime kilns were in operation by the mid-late 1860s. Lime was extracted from a hill in the area and fired in the kilns. By the turn of the century kiln use had declined as it was more economic to extract lime from Milburn, south of Dunedin, which had the advantage of being near a railway line. In 1976 New Zealand Cement Holdings gifted the lower kiln, together with the adjacent limestone quarry to the Otago Peninsula Trust. Restoration work began and was supported by the NZ Historic Places Trust. 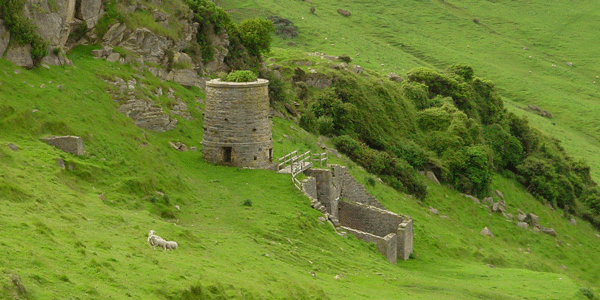 The lime kiln is protected and maintained by the Otago Peninsula Trust and is open to the public to view. This typical Edwardian villa was built in 1909 by Sir James Fletcher, founder of Fletcher Construction Company Ltd. 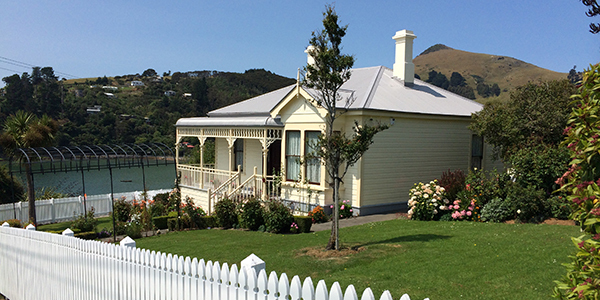 In December 1990 Fletcher Challenge decided to restore the Fletcher House and open it to the public, making it the first villa in New Zealand to be opened for all to enjoy. Discover Kororā, the Little Blue Penguin, the world’s smallest penguin. See them in their natural habitat – scurrying up to their cliff-face burrows at Pilots Beach on the Otago Peninsula. After a day at sea, the penguins congregate in groups known as “rafts” not far offshore where they often can be heard vocalising – usually short, loud squawks. 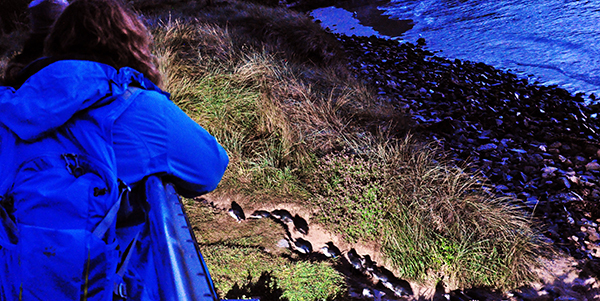 Blue Penguin viewing tours are at dusk when penguins come ashore and make their way to their nests where they feed their chicks or roost. Throughout the year local school groups spend time in the nature reserve taking part in the Planting for Penguins programme operated by the Education team at the Royal Albatross Centre. Thousands of native trees have been planted on the headland to provide a level of vegetation not seen in years, with the hope of returning if to the condition it once was where the headland was covered in green native bush and shrubbery.